I have some sport squadrons and v2 squadrons awesome lights very impressed with the quality and ability to change lenses and patterns. Love my 40" Onyx6 bar. Love my Squadron XL's! These lights on their own are brighter and carry farther than my buddies 30" and 11" light bars combined! A very quality product! Do you mind if we use the pic ? Id like to see a pic of those squadron XLs at night. Im trying to decide which lights to go with. We don't do alot of night riding so I just want 1 set of lights. I have the sport squadrons and two XL's would be the best if you only want two lights. They are very bright. Here is a photo from KOH. This photo is 4 Squadron XL's. If you're looking for 1 Pair of lights, the XL Pro Driving/Combo would be ideal! With a 4,300 lumen count and power draw of 42 watts, the XL Pro is the only single housing LED auxiliary light on the market that has the distance of an 8” HID with the smooth spread of an LED. Perfect for enthusiasts that need a vast amount of light and are looking for something other than a light bar. The XL Pro includes three interchangeable lenses, and is capable of covering more lighting zones than any other light on the market. I personally have not seen or tested the new XL Pro light, but I find hard to believe that a current LED light can produce the same distance as a 8 inch Hella HID light. Also are we comparing Spot to Spot, or Driving to Driving? Can we see what a Driving or Spot would look like? In the picture above it says these are Cornering lights, while the light looks great, the distance is not all that impressive when you know the real measurement of the road stripes. DOT Federal Regulations mandate that all road stripe be 10 ft long and they have a 30 ft gap between them. The highway reflector would split the 30 ft gap. So by looking at the picture above and figuring the trucks bumper to be at the end of a painted stripe the light looks to be producing approx 130 ft of usable light. That's 43 yards. While this is a brighter more pure light, I don't think that distance is much more then a standard headlight. I would like to see a side by side comparison of 2 comparable LED Driving or Spots, to 2 HID Driving or Spots, to see if the LED can really compete with the HID in distance. Amperage the LED has the HID beat and in many cases that is a of huge importance. I personally have not seen or tested the new XL Pro light, but I find hard to believe that a current LED light can produce the same distance as a 8 inch Hella HID light. Also are we comparing Spot to Spot, or Driving to Driving? Can we see what a Driving or Spot would look like? 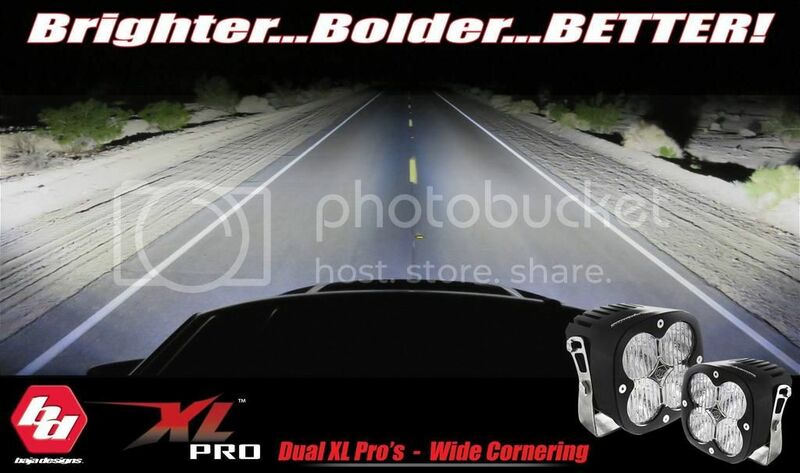 I can work on putting together a Night Shot of the XL Pro Driving and Spot for you! Post up your lifestyle images! We have a great UTV Specific Harness for your Ride! Pair it with one of our 15% OFF Racer Edition OnX6 LED Light Bars! Very happy with my squadron pros. Used the SII lights in the rear to accommodate BITD required safety lights. 2 amber, 1 blue, 2 red. At 2K lumens per piece they are wicked for the space they take up. The light intensity is so much for such a small housing I cant really get a good video of them from behind. Love our Baja Designs lights on our race car! Thanks for the support! *OnX6 Arc Racer Edition ONLY available with ALL Combo Lenses. We are making these changes due to the fact these lights perform at maximum performance in these patterns. Running them in a different pattern will reduce the performance.